Wearing - Jumper: Bershka. Jeans - Forever21. Boots - Office. So, with not shooting an outfit in a month I suddenly become awkward and unable to take a nice photo! But alas, you can see the outfit at least. I got these jeans near the beginning of the month and have literally fallen in love. They are so loose-fitting and comfortable, have the right amount of 'distressed denim' and I just really like how they sit. When I first tried them on, before a school mufti day, I instantly disliked them and was going to send them straight back. But reflecting on that I knew the only reason I disliked them was because they were so different to what I usually wore. But I knew that 'Life begins at the end of your comfort zone' (cheeseyy, I know) and took the plunge to wear them to school. And actually felt confident wearing something different! I have seen this hairstyle around a lot at the moment. At first on Kylie Jenner, my friend Emily and then on Megan. After a few attempts I think I got the hang of it, and it was soo comfy! It was just really handy as all my hair stayed off my face but it was still 'down' in a sense. This afternoon I'm off to London (one of my three trips this week!) with my family to go out for a meal and see War Horse to celebrate Madeleine's birthday and the fact she goes to Australia on Wednesday for two months - jealous doesn't even begin to cover it! 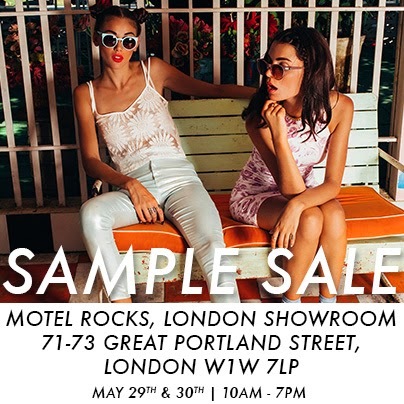 Motel Rocks always have sample sale's in London and every time I really want to go but can't because it's in London and school etc buuut on Thursday they are having one on Great Portland Street and I'm already going to be in London for a Topshop personal shopper thing (more about that later) so am going to pop along! I'm very excited to see what they have to offer! Now watching: Lily Pebbles new video - it's just so inspiring and says what I think teenage girls need to be reminded of. Loving this soososoosososo much, especially the jeans, and the hair is cool! I have also been seeing it around everywhere, and I love it!